Soybeans has been processed in many ways in Japan. Natto is one of them. Because of the strong smell and peculiar taste, some people don't like to eat. Generally, people who live in or north of the Kanto area (Tokyo area) love natto very much. Mito City in Ibaragi Pref. 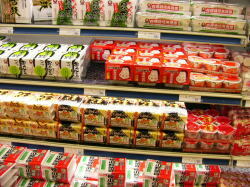 is famous for good quality natto which called "Mito Natto". Natto is made by adding nato bacteria to steamed soy beans and fermenting..